I'm over the moon to be hosting this amazing giveaway, featuring prizes from no less than SIX of my absolute favourite independent online stores! 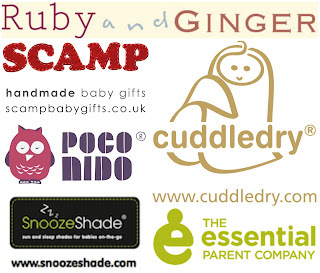 Yes, the winner of this competition is set to bag themselves a whole bundle of goodies worth over £150, made up of a Nappy Purse from Ruby and GINGER, a copy of The Essential Baby Care Guide narrated by Professor Robert Winston, an original deluxe SnoozeShade, a Snuggle Up baby blanket from Scamp Baby Gifts, a CuddleDry baby apron towel and a pair of Poco Nido Hare and Tortoise Mini shoes and matching t-shirt or body suit (in the winner's choice of size). First up, Ruby and GINGER's iconic Nappy Purse. I'm already the proud owner of one of these and you can read my review of it here. It really is the perfect mini changing bag and if you're like me and have a bit of a thing for handbags then this is a must have as it means you can just tuck it into your regular handbag and have all your baby changing paraphernalia neatly in one place. This compact change bag holds 3 large disposable nappies and comes with a refillable wipes case and a matching foldaway travel change mat. 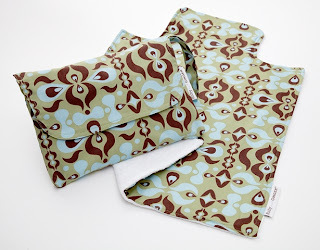 It also has an internal pocket that is ideal for nappy sacks or a small tube of cream. It's also super handy for when you're popping out and don't want to take a bulky handbag or changing bag at all as it can be hung over your pram handlebars or popped into the shopping basket underneath. It really is an everyday baby essential. 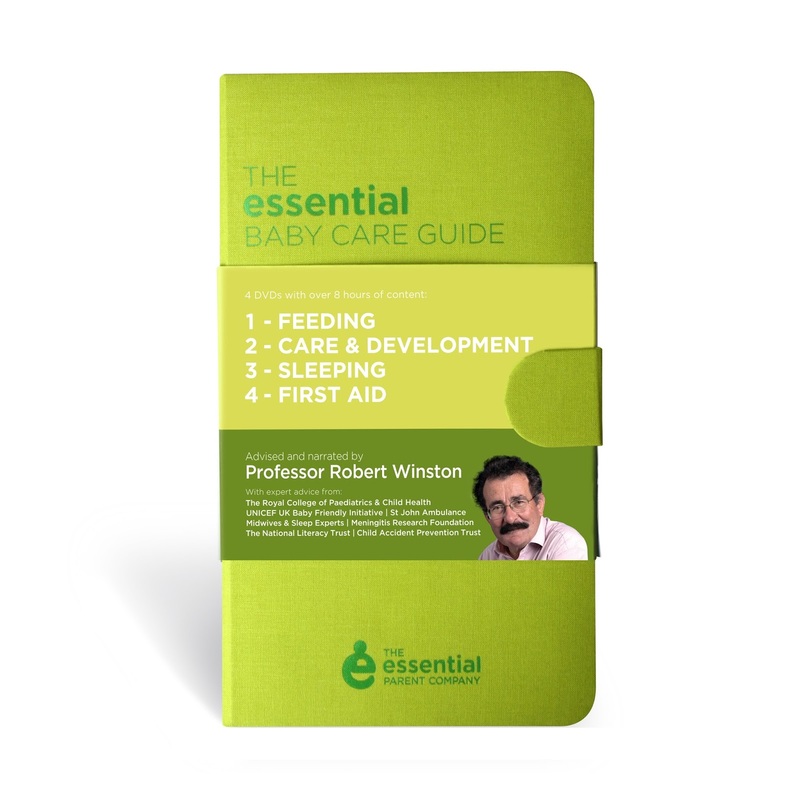 The Essential Baby Care Guide is made up of 4 DVDs with over 160 high quality videos demonstrating everything you need to know about how to look after your baby in their vital first 12 months. It's introduced and narrated by everyone's favourite Professor, Robert Winston, and comes recommended by top UK organisations including The Royal College of Paediatrics and Child Health, UNICEF Baby Friendly, St John's Ambulance, Child Accident Prevention Trust and Meningitis Research Foundation. The guide covers breastfeeding, formula feeding, weaning, sleep, crying, everyday care, baby health, first aid and accident prevention - all with real parents and babies. Each subject is demonstrated and explained clearly by experts including experienced midwives, teachers, doctors and consultants, first aid trainers, sleep experts, developmental psychologists and nurses. Next up we have a SnoozeShade Original Deluxe, which is a sun and sleep shade for single prams and pushchairs with a hood. It is for use with babies up to approximately one year old and is made from breathable, premium lustrous grey fabric which blocks 97.5% of UV rays and offers UPF40+ protection. 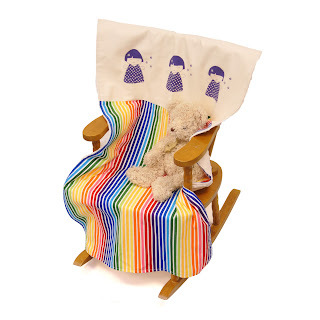 It creates a dark, cosy environment to make any time sleep time, helping to maintain baby’s routine - perfect for holidays or when you're out and about. The sneak-a-peek zip lets you check easily on your tot while the sleeping baby emblem discourages people from disturbing your baby. 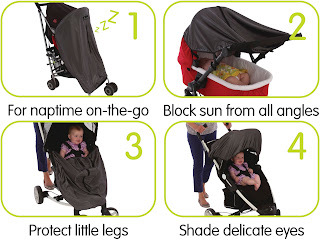 The SnoozeShade is super versatile and can be used in four ways to help baby sleep or create valuable shade. Also included in the bundle is a gorgeous and very, very cosy Snuggle Up baby blanket from Scamp Baby Gifts. As with all Scamp products, the designs are entirely original and the quality is exceptional and this blanket (you have to trust me on this!) is unbelievably soft and snuggly as the name suggests. It has been designed to be able to withstand lots of cuddles and any baby will be proud to be seen wrapped up in this little number. 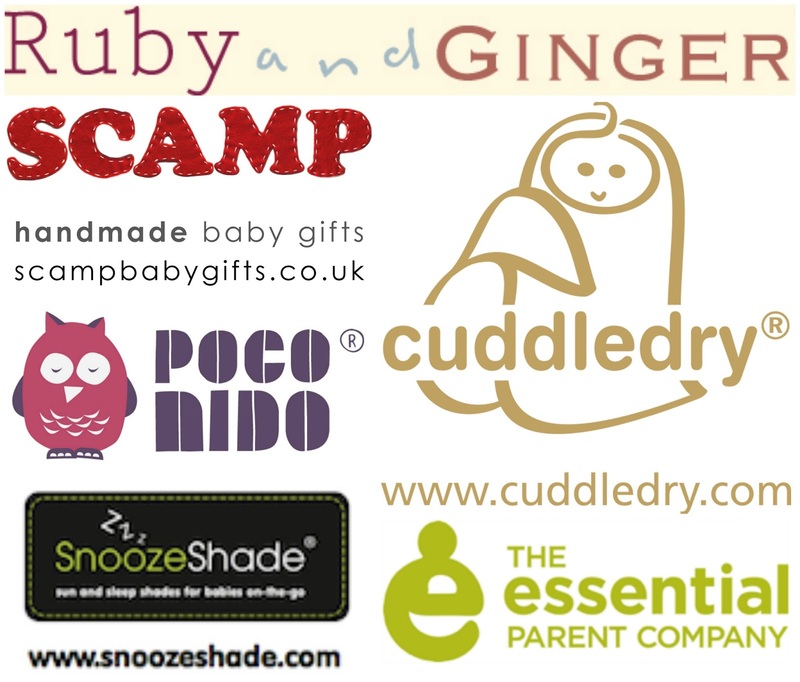 You may have seen the Cuddledry inventors on BBC's Dragons' Den! The Dragons loved it but Cuddledry turned them down! The Cuddledry® baby apron towel is an award-winning, innovative baby bath towel that allows mums and dads to have two hands free to safely bath, lift and wrap their baby. I don't know about you but before I discovered the Cuddledry®, getting Evie out of the bath always involved getting myself and the bathroom floor SOAKING. I had to hold the corner of a towel in my teeth! This double layer hooded towel is worn like an apron and really does take the stress out of bath time. The Cuddledry is a ‘must-have’ for new parents and would make an awesome gift. Last but by no means least is the Poco Nido baby vest or t-shirt and matching mini shoes. 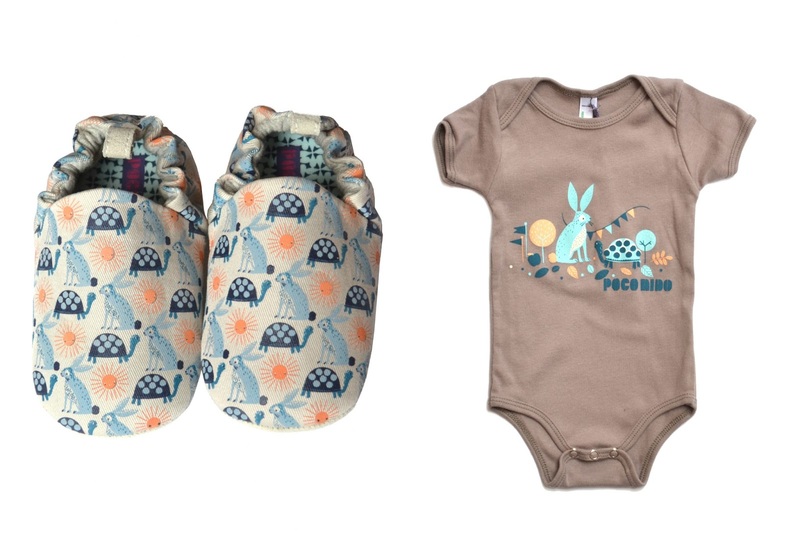 We are huge Poco Nido fans and have reviewed their wellies and mini shoes before (you can see the post here). The hare and tortoise mini shoes are made from 100% cotton with a suede sole and printed with non toxic inks, they are safe for walking and non walking babies. They come packaged in Poco Nido's unique cardboard tube box which doubles as a gift box and comes with instructions on how to recycle the waste into a money-box. Sizes range from 3-24m. 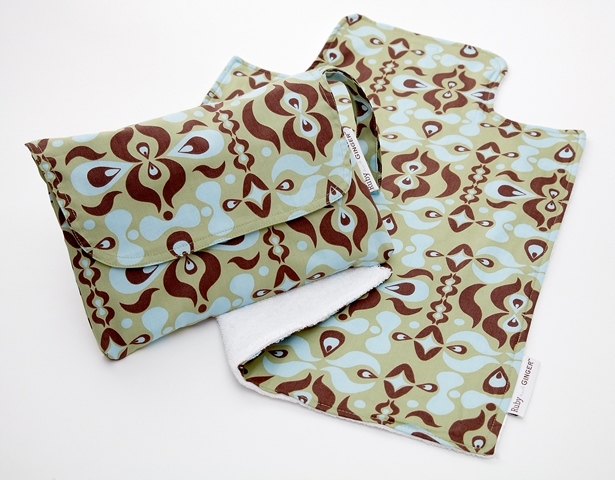 The baby body is made from soft organic cotton and is hand printed in Sheffield by real people which I LOVE. Sizes range from 3-12m, t-shirts are available up to 24m. As per my usual giveaway terms and conditions, I'm using the Rafflecopter widget below and seeing as it's such a MEGA GIVEAWAY everyone is entitled to a whopping FOURTEEN entries each. The competition closes at midnight on 13th August 2013 and the winner will be announced on here, on Facebook and on Twitter on 15th August. This competition is open to residents of the UK and Ireland and the prize bundle will be sent direct from Ruby and GINGER. Hi! was already following on bloglovin as Belle du Brighton. I especially love the nappy purse and the sun shades! Our new pram doesnt have a brilliant sun visor thingy in pram mode! Following on Blogloving. 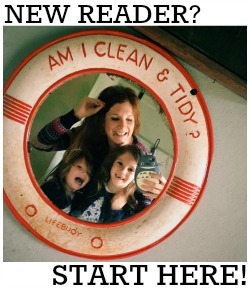 Great blog and fab comp! I've followed on Bloglovin' as Emma Baines/The Style Box. As a blogger who's currently 28 weeks pregnant I'm looking forward to reading back through your old posts and hopefully learning some things!! already following you on Bloglovin. what a fab competition. keeping everything firmly crossed, would love this for our new arrival due on 9th September. awesome give away! Almsot makes me want to have another baby! Thanks for the comp - followed on bloglovin.